Despite the abundance of cafes and restaurants found in Stockholm’s Old Town, there are only a select few that I frequent regularly. Like many tourist destinations, the Old Town is no exception when it comes to overpriced restaurants catering to the tourist who will never return. Café Stiernan is an exception. 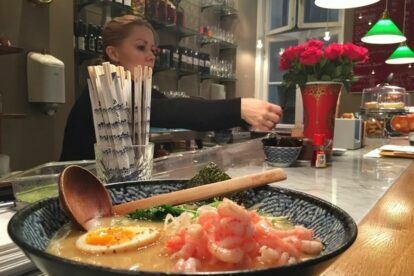 Enjoy the friendly atmosphere where owners Paris and Pernilla serve the best Ramen noodles in town. If the café itself is small, the portions served are large and made using fresh and high quality ingredients. The coffee served here is also top notch and another reason to step inside and take a seat on a bar stool overlooking busy Österlånggatan. Its small size and the fact that this is where many locals end up for lunch, can make it busy especially around 12:00 – Swedish lunchtime. In summer tables and chairs are added on Österlånggatan as well.